The Condado Plaza Hilton in San Juan, Puerto Rico is the perfect vacation destination for families who want a modern luxury hotel with all the resort amenities but who also like to explore their cultural surroundings. 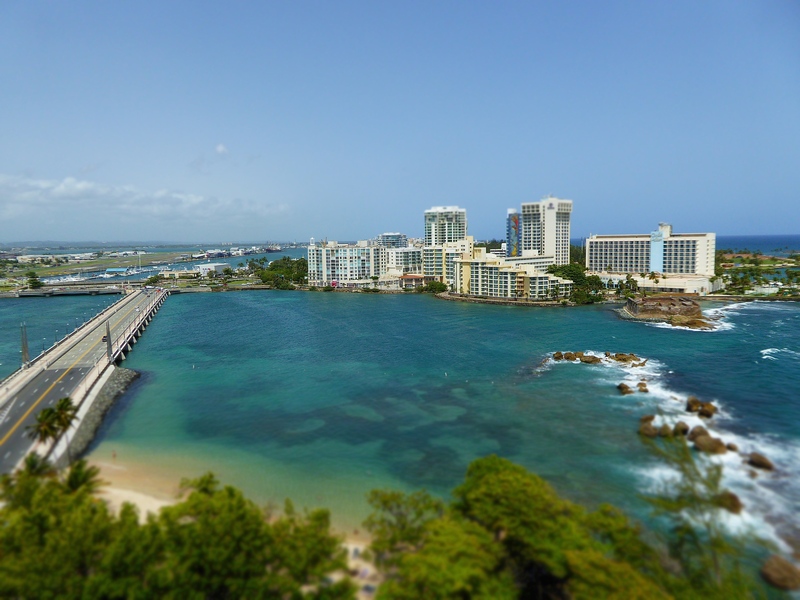 The Condado district was first developed in the early 20th century by two rich American industrialists, the Behn brothers, who convinced other wealthy Americans to build their vacation homes here. The uber-wealthy eventually deserted it for other fashionable locales but by the 1950’s and 60’s it re-emerged as a popular North American tourist destination known as the ‘golden strip’ for its row of resort hotels along the coastline. Although Puerto Rico has gone in and out of favor with tourists over the years, Condado’s overall development as an upscale residential district has kept it current and safe, so it’s still a great destination for families to explore its many restaurants, shops and world-class museums while still enjoying its tropical location and resort atmosphere. The Condado Plaza Hilton is made up of two towers that are connected by a walkway. The rooms all have a clean contemporary design. The ocean-side tower rooms are decorated with hot and spicy, red and orange tones. Some rooms have balconies and views of the ocean as well as the landmark Caribe Hilton Hotel and the 17th-century Fort San Gerónimo. The rooms in the lagoon tower have cool and relaxing blues, greens and turquoise tones. These rooms and suites either face the lagoon or the avenue. Some have balconies and partial ocean views. 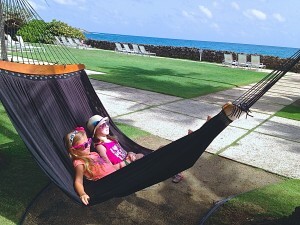 The hotel’s best option for families are the Family Junior Suites in the lagoon tower. They have two separate sleeping areas that include a king-sized bed and two twin beds with an adjoining bathroom, two televisions, a mini-fridge and a microwave—to warm up all those half-eaten dinners for lunch the next day. The Condado area residents are health conscious so you will see many people walking, jogging and biking. 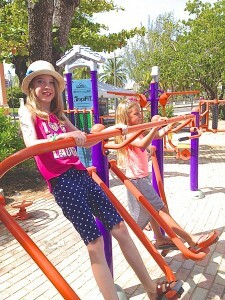 There are even community parks with exercise equipment that are enjoyed by people of all ages. In keeping with the community attitude, the Condado Plaza has many options for fun physical activity. 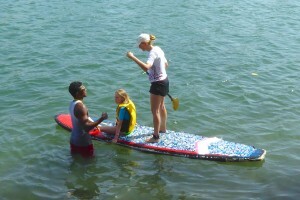 Search for the resident manatees in the lagoon with stand up paddle boards, peddle boats, windsurfing boards or kayaks, which can be rented. Tip: check out the hotel’s activity calendar for free lessons. Introduce your children to snorkeling straight from the hotel’s adjoining beach. Snorkel gear can be rented at the hotel, bring your own, or buy them at the gift shop to explore the calm clear shallow waters that are perfect for those new to the activity—just watch out for some of the sharp corals. 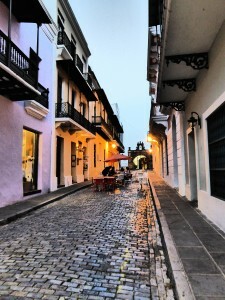 Rent bikes and ride to historic Old San Juan for the day. A 24 hour fitness center, located on the lagoon side, has a large bright well-equipped workout room along with a steam room, sauna and whirlpool to relax after a good workout. The activity pool has a water slide and while kids are having fun parents can keep an eye on them in the adjoining swim up bar. If the main pool is too hopping for your taste you can head over to the tranquil lounge/lap pool at the lagoon tower. A salt-water pool is available for those who don’t like chlorine while they swim. There is also a jacuzzi and a toddler pool to round out all your possible swimming needs. Adjacent to the pool area is the game room where kids can stay and play or sign out ping pong paddles or board games to play poolside. After swimming, kids can run off their remaining energy on the open area at the ocean side of the hotel and hopefully take a nap afterwards in one of the many double hammocks while you kick back with a cool drink and a good book. Learning, exploration and fashionable accessories were a win win for our family with ScoutAbout, the scavenger-like family program available at select Hilton Worldwide hotels throughout Florida and Puerto Rico. Outfitted with a special ScoutAbout map customized for the property, families explore the hotel in search of ScoutAbout signs at 10 Points of Discovery unique to the property and local region. My favorite discovery was learning about the centuries-old legend of the Dog Rocks about a sailor and his faithful companion. 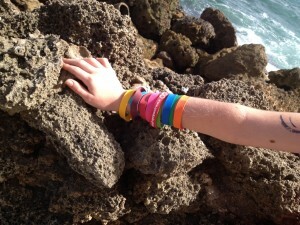 For each discovery point found, a child gets a color-coded wristband. Once all the bands have been collected, guests get a glow in the dark trophy band. 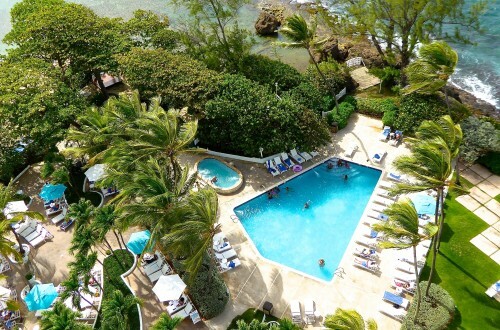 Old San Juan – The Condado Plaza Hilton’s location near the historic Old San Juan is definitely a plus. One of the oldest settlements in Puerto Rico, it has many historic sites to see including the Fort San Felipe del Morro. Named in honor of King Philip II of Spain, the fortification was designed to guard the entrance to the San Juan Bay, and defend the Spanish colonial port city of San Juan from foreign enemies. With its blue cobblestone streets and Spanish-influenced architecture, this picturesque town also has many shops, open-air restaurants, plazas and churches to explore for an entertaining day away from the pool and the beach. 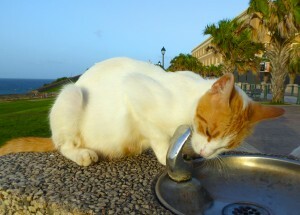 TIP: Much to my daughter’s delight, there are an unusual amount of cats roaming around Old San Juan (we counted 27). The town is said to have hundreds of feral cats that consequently control the rodent and pigeon population. Photo: Angela Tiffin, History Buff Traveling Mom – This little guy would wait for tourists to turn the fountain on. Save A Gato (SAG) is a non-profit organization that manages a colony of cats on national park land. SAG traps, vaccinates and neuters the cats and then releases them. Although most of these cats are probably safe and many are friendly, you should remind your children that they should be cautious as they are still wild. Fort San Gerónimo – Pivotal in repelling British invasion in the 17th century, the fort is located adjacent to the Caribe Hilton Hotel and is walking distance across the bridge. Museo de Arte de Puerto Rico – Learn about the history of Puerto Rico and its art. It is a short taxi from the hotel or a two mile walk. You don’t need a passport and you won’t have to wait in long immigration lines. The weather is almost always hot and sunny. The flights are more reasonable than to many other Caribbean Islands. Condado is a short commute to the airport. Teenagers can still have access to their devices without it costing you a fortune because there are no foreign roaming fees. 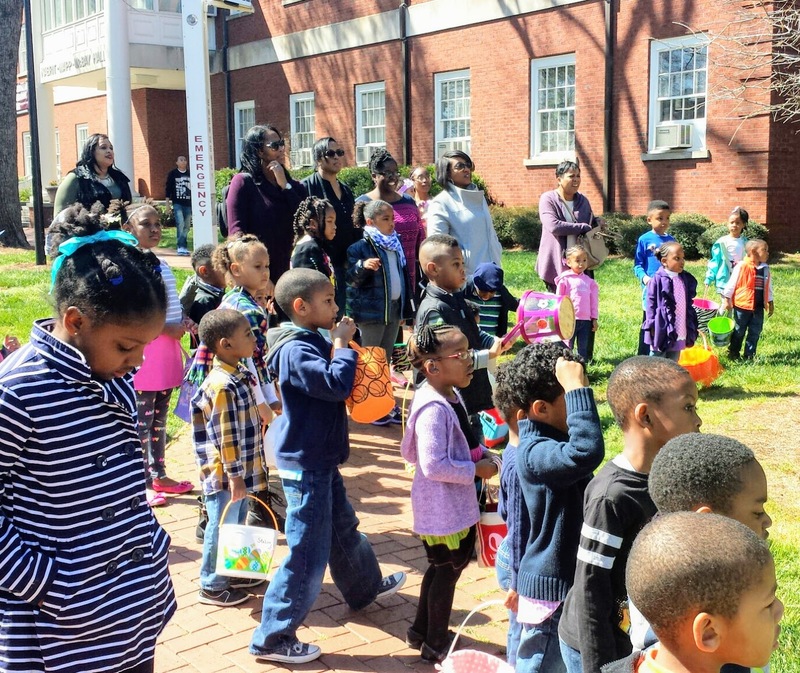 It is located in a safe neighborhood where you can take an evening stroll off the property.